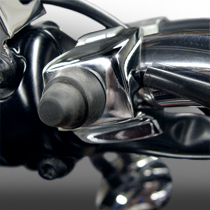 * Will not work with SwitchBlade® or Spartan® Windshields. 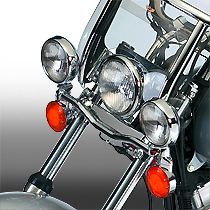 We manufacture a complete line of Spotlight Bars and guarantee a perfect and complementary fit with our SwitchBlade®, Spartan®, Heavy Duty™ and Dakota™ 4.5 Windshields as well as with our Chrome Lower Deflectors. Got an old school bobber or 70s-era chopper? 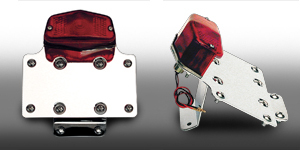 Our chromed Custom Tail Light helps make it legal. 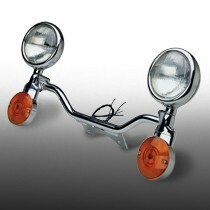 The bulb is 12-volt and come with standard wiring harness plugs and wire splicers for quick installation. Model N970R12A mounts on either side of the rear axle and has a double thick plate and reinforced ribs to eliminate vibration. 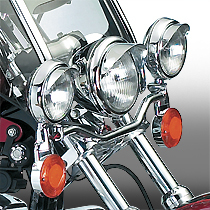 Model N971R12A mounts on the rear fender and has a contoured base for a flush fit and traditional custom look.